George Graham Reviews Ryan Adams' "Ashes and Fire"
Some artists tend to move within a narrow stylistic range, either because of a desire to stay in an artistic comfort zone, or because they might fear abandonment by their fans. But others are creatively restless, trying different things and exploring new avenues for collaborations. Some of the most durable solo artists tend to take this approach, Bob Dylan being a salient example. This week, we have a new CD by another stylistically restless artist who in his 17-year recording career has done quite a lot of things, some more artistially successful than others, but much of it quite impressive. 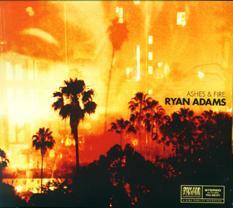 Ryan Adams has just released his approximately 13th solo album called Ashes & Fire. Thirty-six-year-old North Carolina native David Ryan Adams showed a penchant for writing at an early age. His parents bought him a guitar and he eventually dropped out of high school in 10th grade to play in a punk rock band. But after finishing his GED, and playing in a couple of short-lived bands, Adams moved into alternative country or roots rock and founded the band Whiskeytown, which quickly attracted attention. They released three albums, two on major labels that won praise. But by the time the third Whiskeytown CD was released in 2001, the band had broken up and Adams was off on a solo career. It included some roots rock recordings, some of which attracted significant figures like Emmylou Harris in supporting roles. Then he founded the Cardinals who released four albums starting in 2004. In 2006, Adams produced Willie Nelson's album Songbird, which featured the Cardinals as a backup band. In 2009, Adams announced that the Cardinals would be on indefinite hiatus, though some previously recorded Cardinals material continued to be released. The band's music ranged from country-influenced to edgier material. Then last year, Adams released Orion a hard-rock album. Now, Adams made another yet turn, this time to laid-back tasteful folk and roots rock. Ashes & Fire features different personnel than the Cardinals, essentially a group of studio musicians, and was produced by the veteran British producer Glyn Johns, who was responsible for classic LPs by the Rolling Stones, the Who, the Eagles, the Steve Miller Band, Eric Clapton and many others. Interestingly, Glyn Johns is the father of Ethan Johns, who produced the early Whiskeytown album. One of the names that sticks out on Ashes & Fire is the pianist, Norah Jones, who mostly plays rather than sings. Also on electric keyboards is Benmont Tench of Tom Petty's Heartbreakeres, plus bassist Gus Seyfert and drummer Jeremy Stacey. There are guest appearances by a string quartet and Neal Casal from the Cardinals also appears on a couple of tracks, as does Adams wife Mandy Moore, doing backing vocals. Perhaps it was Adams reaction to his last album, perhaps because of the classy players involved, or perhaps it was the very tasteful, understated production of Glyn Johns, but I think that this is Ryan Adams best recording yet. The material and the performance is rather laid-back, but it lets his fine classic-singer-songwriter compositions come to the fore and reminds us of his appealing vocals, when he wants to do the style. The songs are lyrically interesting, and in folkie tradition of ambiguous poetry. And while there is nothing particularly distinctive about the sound, it is so tastefully done that it immediately stands out. Singer-songwriter Ryan Adams' new 13th solo album Ashes & Fire is my favorite of the recorded output of this prolific and restless artist who has jumped from heavy, punky-influenced music to roots rock to classy folk. Adams has the ability to attract a lot of well-known musicians to his projects, and this one is no exception with Norah Jones playing piano, and production and mix by the veteran producer Glyn Johns. It's a fine collection of songs with a thoroughly tasteful sound evoking artists like The Band or Neil Young. Adams does not break new ground in terms of any kind of an innovative sound, but he really puts it all together, realizing the potential he has shown since the beginnings of the band Whiskeytown. Our grade for sound quality is a definite "A." Producer-engineer Glynn John has not lost his touch, giving the recording an almost intimate sound that keeps the focus on the music. And, refreshingly, the CD has a much better dynamic range than most rock albums these days. Ryan Adams may not stay in one place too long in his artistic quest, but it's great that he made a stop at the folky-rootsy-rocky intersection that he does so well on this CD. (c) Copyright 2011 George D. Graham. All rights reserved.